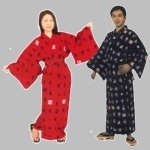 A "Yukata" is a rich cotton robe, similar to a kimono. It's often used as a dressing robe or bathrobe in Japanese homes, hotels and inns. These items are imported straight from Japan. The yukatas are all 100% cotton and machine washable.